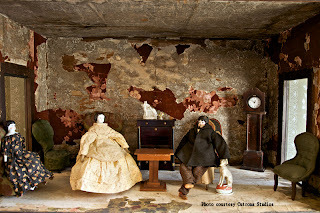 Some weeks ago I posted about the dollhouses at the 1809 Hedge House. Shortly thereafter the Executive Director of the Plymouth Antiquarian Society kindly sent me additional information,* from which I’ll quote at length, since the story is a window into the past. 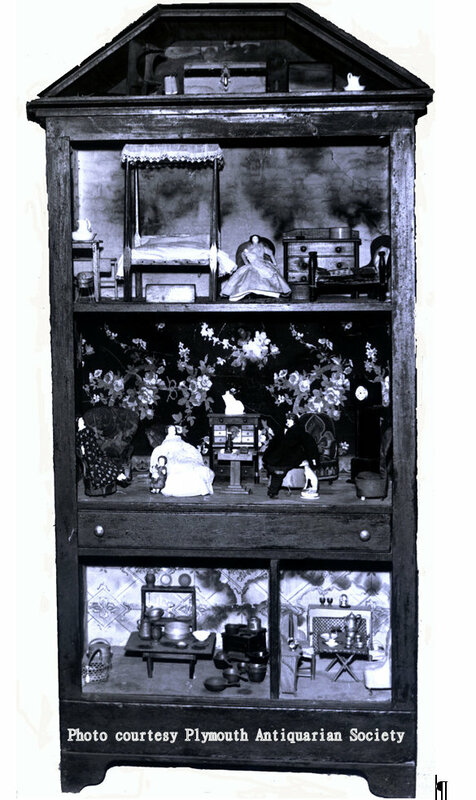 The Brewster Dollhouse “was actually made in part from pieces of an old tea crate – there are remnants of painted Chinese characters on the back, and the original lining paper is still visible, though covered with fragments of several layers of later dollhouse decoration” (as seen in the Cutrona Studios photo). Flora Louisa Brewster received the ‘Baby House’ on her 6th birthday on January 15, 1855. 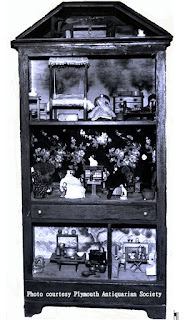 “Although it was not professionally made, the dollhouse was carefully crafted like a large piece of case furniture. It provided 3 floors of doll’s living space, an attic, and two drawers for storage, and featured glass windows on the sides." The maker was 80-year-old George Humphrey. Mary Thomas added the mahogany bedstead and dressing case, and an iron waiting man. Elizabeth Emeline added a brass pudding pan, a brass candlestick, a mahogany dining table, and a small red tin trunk. Ada Augusta added two mahogany chairs, a center table, a bureau, a chair made by a German, and a churn. Emma Eudora added a dining room table, a psyche glass, and a kitchen chair made by a German. Flora added a doll’s photograph album, a kitchen chair made by a German, two marble statuettes, and a chamber set. Eva Octavia added two parlor chairs, a leather valise, and an iron kettle. Ernest Elisha Wrestling added a china dog, a donkey with panniers, and a mouse. & James kept a dissecting map, 2 sets of ten pins, a parlor football, and a pair of parlor skates. I like that the house was shared by the children and they each added items to its contents. I have spotted a sledge in the attic which I cannot see in the earlier pocture of the house, so assume the furniture has been rearranged between photos. i wonder if the maker was related to the children, perhaps he was their maternal grandfather or a great uncle. What a lovely piece of family history all contained in this dollhouse! 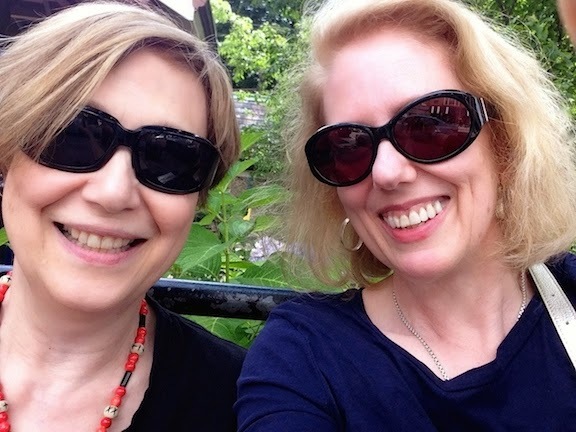 Thank you for sharing this charming story of love for children, which brought a tear to my eye. I've always been fascinated by these charming houses. Thanks for showing me one from so long ago. Perfectly charming. That is a very sweet doll house very much loved by the children who played with it. I'd like to see larger pictures in more detail.